It’s only been four months since the last Earth Defense Force game made it over to the west, and now here we are with another one. Earth Defense Force: Iron Rain is a little bit different from the usual entries in the series though. Developed by Yuke’s, known for its work on the WWE 2K games, it’s a hell of a lot prettier for one. Thanks to the utilisation of Unreal Engine 4, environments look more realistic than ever, and your enemies more fearsome. Character models have been improved, too, though their animation still isn’t anything to write home about. But I can safely say that for the first time, and hopefully not the last, I’ve been impressed by how a Earth Defense Force game looks. Of course, the additional eye-candy has some ramifications. 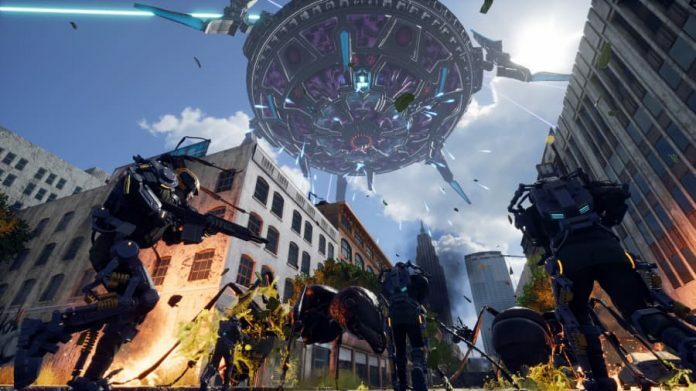 Performance isn’t as smooth as what Earth Defense Force players are used to, especially on a base PS4. There’s nothing so bad as to put you off playing the game, but you will experience some framerate drops from time to time. There’s noticeably fewer enemies on-screen at any one time, too. Don’t get me wrong, there are still bucket loads, but maybe one or two less bucket loads. To seemingly compensate for there being less enemies, they’re generally more vicious than ever. Giant ants are very eager to bite you and/or send projectiles your way, humongous spiders jump around around to make themselves harder to target and release smaller spiders to catch you unaware, and one particular new enemy will make your life hell at range, especially when there are a few of them. 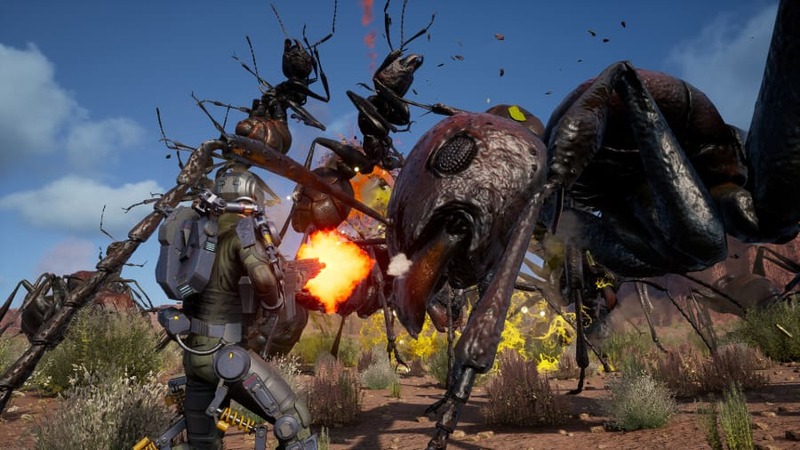 Earth Defense Force: Iron Rain eases you in quite gently, but once you’re about 20% of the way into its mission on normal difficulty you might start feeling some heat. Thankfully, alongside the snazzier visuals, there are some other changes that are more meaningful. That’s right, we’re talking gameplay changes. A new approach to classes is one. You can now change your class between missions, though not all of them are available from the outset. 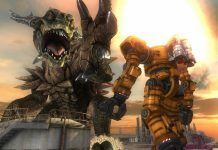 More notably, however, certain weapons are not tied to specific classes in Earth Defense Force: Iron Rain. You can, for example, choose to be a nimble Jet Lifter equipped with a massive minigun. Instead, each class has distinct perks to differentiate it from the others, as well as its own overdrive ability to give it an edge on the battlefield. The result is that Earth Defense Force: Iron Rain gives you more leeway to tweak your playstyle than ever. There are so many equipment combinations that you could spend a lifetime trying them all out. And now there are visual customisations, too. 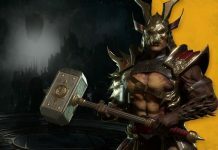 You can create your own male or female character and equip them with a wide range of attire that you unlock as you play. Never before has an Earth Defense Force game given you such freedom to express yourself. Unlocking new items and increasing your hit points is handled a bit differently from past games, though. While weapons and support items are still unlocked by completing missions, you now need to buy them before they’re available for use. The same goes for new visual customisation items. Your maximum hit points, meanwhile, is now raised by buying upgrades rather then collecting them during missions. The coin required to purchase most upgrades is acquired simply by completing missions. Many items also require a specific number of coloured gems, however, and they can only be acquired by killing enemies and sweeping up the precious loot that they drop on the battlefield. 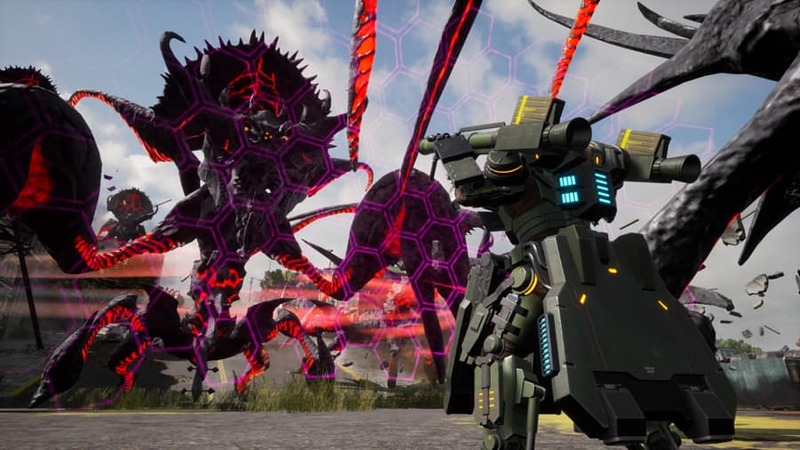 Despite all the changes made in Earth Defense Force: Iron Rain, it still very much feels like an Earth Defense Force game. It’s insane fun from the get-go, and even though there’s an attempt to deliver a more cohesive and serious story, it’s still cheesy as hell. 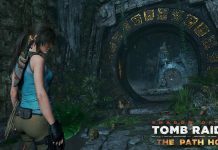 There are just over 50 missions to tackle, and multiple difficulties that make continuing playing the game after you’ve completed them worthwhile, but some players will undoubtedly find the experience repetitive. As hard as it is to believe, you can only shoot giant bugs and robots for so long before it isn’t all that fun. It’s great to be able to dip into such mindless action now and again, though. As usual, engaging in large-scale combat doesn’t have to be something you do alone, either. Split-screen co-op is available, and also online co-op, which allows you to play with even more squad members. 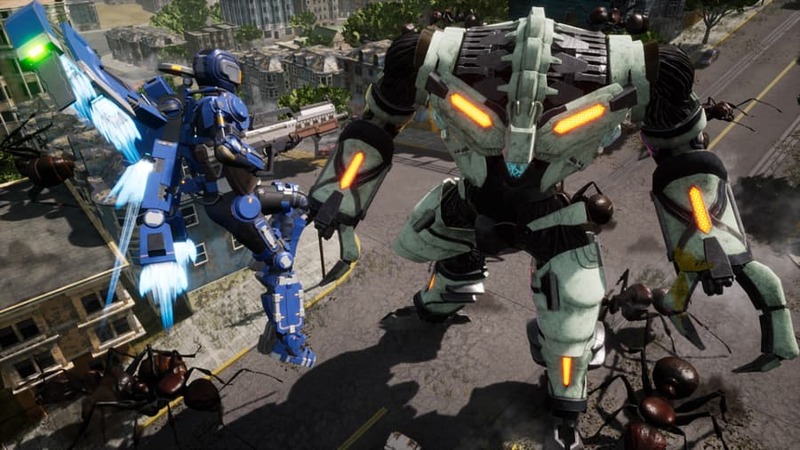 Earth Defense Force: Iron Rain plays great online, too. There’s even a new online competitive mode called Mercenary, in which two teams of four players compete for gems. It’s fun, but it’s probably not going to hold your attention for very long compared to the game’s campaign. Honestly, Earth Defense Force: Iron Rain might just be my new favourite Earth Defense Force game. Sure, it doesn’t throw quite as many enemies at you, and performance isn’t as smooth as usual, but the latter issue isn’t so bad if you’re playing on a PS4 Pro. The improved visuals and gameplay tweaks make it more of an immersive and enjoyable experience, and that’s what really matters. 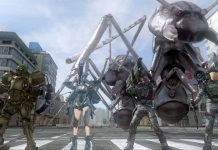 Yuke’s has done a great job with Earth Defense Force: Iron Rain, taking the core experience and tweaking it to make it more personal and accessible. It’s a game that will not only make Earth Defense Force fans happy, but may also attract new ones. To me, that’s a win-win situation. 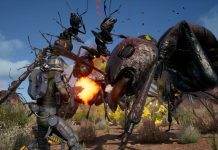 Earth Defense Force: Iron Rain is available on PS4.